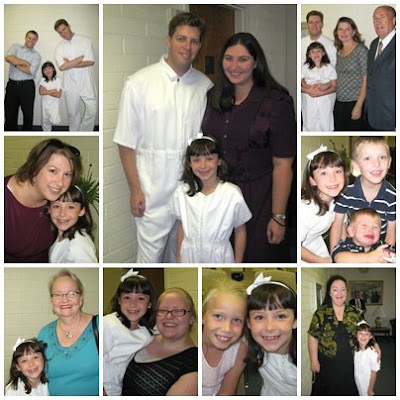 Our sweet Rosie turned 8 last weekend, and we were in Utah to celebrate her birthday and baptism with our family. We had about 35 people from 5 states attend! She was so excited and ready to take upon the covenant of baptism. Aunts, uncles, cousins, neighbors, friends, and grandparents were in attendance. She looked so beautiful in white and said she felt “super clean” afterwards. We had a birthday party for her at Grant and Hollie’s house. We are so thankful for all the time and effort they put in to make the baptism and party come together. We are so lucky to have an amazing circle of friends and family. Rosie was swarmed with Hannah Montana stuff (just like she wanted), some gift cards, and clothes. Sunday morning we went to Temple Square for the Music and the Spoken Word broadcast with the Mormon Tabernacle Choir (since we couldn’t get on that lousy overbooked flight!) 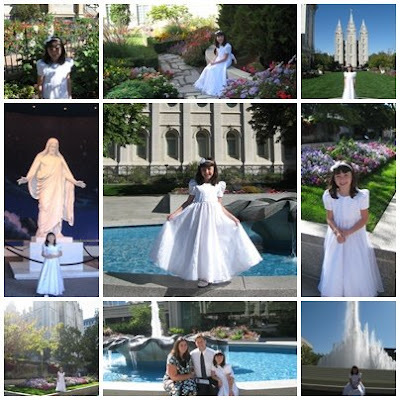 We listened to the choir, toured around the visitors centers and the temple, toured the Lion House, and took lots of cute pictures of Rosie in her beautiful white dress. It was a lovely morning.